For those considering careers in multimedia art and animation, the Bureau of Labor Statistics (BLS) projects 8% employment growth% by 2026. Similarly, art and design careers are projected to grow 4% during that period. As consumers crave more realistic film special effects and video game graphics, the demand for new computer hardware and additional multimedia artists also increases. 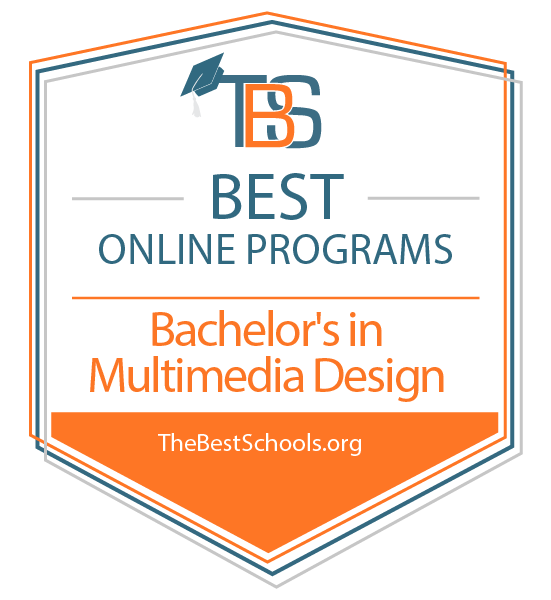 Because numerous types of degrees fall under the umbrella of "Best Online Bachelor’s in Multimedia Design," the following sections display top‏ranked programs from several related ranking articles on our website. What Else Can I Expect From an Online Bachelor’s in Multimedia Design Program? The Penn State World Campus, established in 1998, serves over 13,000 students. The bachelor of design in digital multimedia is an interdisciplinary program for distance learners interested in pursuing careers in multi-domain digital design. Graduates work in creative industries, including digital media, product design, and digital marketing. Students learn how to develop their style of design through training in computer graphics, photography for communications, multimedia design, and application development. Degree seekers must complete a total of 120 credits and a capstone project to meet graduation requirements. Full-time students can expect to spend up to four years completing this bachelor’s degree in multimedia design. Penn State also allows incoming students to transfer course credits from other accredited programs. For the bachelor’s degree, transfer students must complete 36 of the last 60 credits through the World Campus. Penn State is regionally accredited from the Middle States Commission on Higher Education (MSCHE). A private, nonprofit institution in Columbus, Ohio, Franklin University’s bachelor of science in interactive media design teaches distance learners to construct digital gaming programs, mobile applications, and websites. Students explore the technical and non-technical components of interactive development in courses like digital media design, human-computer interaction, flash animation, and web design. Franklin graduates find work as web developers, interactive media designers, social media specialists, and mobile applications architects. This multimedia design degree requires 120 semester hours for graduation, with all students completing a capstone experience. Online students can transfer up to 94 semester hours toward their degree. Depending on the number of transfer credits and course load, most full-time students can complete this degree in under four years. All online students, except for those eligible for a military discount, pay the same tuition. Franklin University is regionally accredited from the North Central Association of Colleges and Schools (NCA). The online bachelor of arts in graphic design and digital media degree at CBU benefits students interested in graphic design and digital marketing careers. Online students learn how to use the industry-standard software, including Photoshop, Illustrator, InDesign, and Dreamweaver. Through courses like intermediate design, advanced typography, and intermediate composition, degree seekers hone skills in photography, lighting, drawing, color theory, and web design. Degree seekers complete hands-on projects to satisfy course requirements and simultaneously build a professional portfolio. CBU is affiliated with the Baptist church and requires online students pursuing a bachelor’s degree in multimedia design to complete six units of religion courses. A maximum of 100 semester units may apply toward this degree, though applicants need a minimum cumulative 2.0 GPA for consideration. CBU is regionally accredited from the Western Association of Schools and Colleges Senior College and University Commission (WASC). The online animation degree at CU Denver prepares graduates for a variety of careers in digital media. Students receive a fine arts education over the course of four years, delivered through CU Denver's state-of-the-art Digital Animation Center (DAC). The BFA in visual arts with an emphasis in digital animation is an illustrative online program that provides students with the theoretical background and technical proficiency to work in various industries. Through asynchronous learning, this computer animation degree online program requires students to complete 13 sequenced courses centered on 3D graphics and animation. The program primarily uses the teaching application MAYA from Autodesk. Core and foundational courses in the BFA cover 2‐dimensional, 3‐dimensional design, color theory, and art history. Note that the DAC accepts students for the BFA in visual arts in the fall semester only. University of Colorado Denver is regionally accredited by the Higher Learning Commission (HLC). National University offers more than 100 programs in an accelerated one-course-per-month format, including an online BA in digital media design. In 180 quarter units, this program helps students learn the essentials of transmedia design theory, production, and management. A hands-on program, the digital media design BA prepares students for industry work straight out of their undergrad program. The program requires students earn at least 45 units in residency. Students take 72 units in the digital media design major. Core classes cover convergence media, 3D modeling, and game scripting. NU offers classes in a four-week format, where students can take up to 12 courses per year. For the capstone, students must submit a final portfolio project. National University is regionally accredited by the WASC Senior College and University Commission (WSCUC). The 120-credit BA in graphic design with an emphasis in 3D modeling and animation blends form and function, teaching students the latest concepts, techniques, and applications used in the industry today. The roadmap for this online animation degree begins with an examination of design, and culminates with courses relevant to work in film, advertising, and the lucrative game industry. In addition to 3D modeling, students learn anatomy illustration, digital painting, and rigging. At the end of this computer animation degree online program, students create a portfolio that demonstrates their mastery of the discipline. Through this online animation degree, students develop proficient skills in Adobe Creative Suite, Maya, and Mudbox. SNHU delivers more than 100 online bachelor’s degrees, and offers a generous transfer policy to prospective students. Southern New Hampshire University is regionally accredited by the New England Association of Schools and Colleges (NEASC). See more of the Best Online Bachelor’s in Animation Programs. Building on the long tradition of education and career preparation at Lindenwood University, the School of Arts, Media, and Communications provides degree and non-degree programs in a diverse array of fields. The School emphasizes the importance of hands-on experience alongside classroom learning, with experiential learning components included at the core of its programs. With numerous online options, professional development services, and other valuable resources, the School meets the academic and professional needs of traditional and non-traditional students alike. The School of Arts, Media, and Communications offers an online Bachelor of Arts in Game Design degree program that prepares students to enter a variety of careers in the field. The program utilizes a comprehensive blend of art theory and practical skills, industry-specific skills, and technical knowledge. Students engage with in-depth coursework, and earn hands-on experience through developing a portfolio and completing an internship. Students emerge prepared to enter careers like game designer, creative director, concept artist, animator, and 3D modeler. Students in the online Bachelor of Arts in Game Design program must also complete a capstone, portfolio and internship. Lindenwood University is accredited by the Higher Learning Commission (HLC). The College of Technology at Davenport University provides a variety of undergraduate and graduate program options in diverse technical fields. Through online program options, internship and scholarship opportunities, labs and workshops, and professional development resources, the College of Technology serves the needs of both traditional and non-traditional students. The College of Technology offers an online Bachelor of Science in Computer Science degree program with a specialization in Gaming and Simulation. The program incorporates a blend of core computer science coursework, specialized coursework, and hands-on field experience. Students develop a strong foundation of knowledge and skills necessary for success in the field. The curriculum emphasizes key aspects of computer science and game design, with courses in areas such as programming languages, 2D and 3D game development, modeling and simulation, and collaborative development. Students prepare to pursue a variety of careers, including game designer, level designer, animator, and 3D modeler. Students in the online Bachelor of Science in Computer Science program must complete an internship. Davenport University is accredited by the Higher Learning Commission (HLC). Through the College of Online and Continuing Education, Southern New Hampshire University serves the needs of a diverse population of non-traditional students. With a wide selection of undergraduate, graduate and professional programs in fields ranging from business to liberal arts to social sciences, students of all interests and backgrounds can find something that serves their educational needs. The College provides plenty of resources, support, and professional development services. The College of Online and Continuing Education offers an online Bachelor of Arts in Game Art and Development degree program for students seeking to utilize their creativity in a variety of game design professions. The program develops a balanced foundation of knowledge and skills necessary to game design. The curriculum blends computer science principles with aspects of art, animation, design, storytelling, and mythology.. Students prepare to pursue a variety of careers in video game design, including lead artist, lead storyteller, modeler, animator, and designer. Students in the online Bachelor of Arts in Game Art and Development program must also complete a capstone. See more of the Best Online Bachelor’s in Game Design Degree Programs. The Department of Studio and Digital Arts at Liberty University provides undergraduate and graduate programs for students who wish to hone their skills in diverse visual mediums. One of three departments in the School of Visual and Performing Arts, the Department meets the needs of visual arts students through flexible online programs, internship and scholarship opportunities, student organizations and galleries, and numerous creative resources and tools. In keeping with the mission of Liberty University, the Department emphasizes Christian values at the core of its many programs. Through the Liberty University Online platform, the Department of Studio and Digital Arts offers an online Bachelor of Fine Arts in Graphic Design degree program for students seeking to turn their artistic passion into a lasting profession. The program develops a strong foundation of knowledge and skills in the field, incorporating theoretical and historical approaches to graphic design, as well as practical approaches to creating new work. The curriculum covers key topics like graphic design technology and software, history of the field, typography and drawing, vector illustration, and publishing. Students prepare to pursue a variety of careers, such as product designer, creative director, marketing manager, and public relations director. Students in the online Bachelor of Fine Arts in Graphic Design program must also complete a professional practicum and an internship. The College of Arts and Sciences at Bellevue University provides a variety of undergraduate, graduate, and professional programs across diverse fields of study. With flexible online programs, internship and scholarship opportunities, student organizations, and professional development services, the College maintains a commitment to the professional success of its students. The College of Arts and Sciences offers an online Bachelor of Arts in Graphic Design degree program that combines aspects of marketing, communications, advertising, and graphic design. The program develops a balanced foundation of theoretical and practical knowledge and skill through coursework that covers key topics in the field. Students engage in coursework that addresses branding, web design, print design, history of the field, and other fundamental concepts. Students prepare to pursue graphic design careers in a variety of professional settings, including brand management, animation, web design, advertising, creative design management, integrated marketing management, and corporate printing. Students in the online Bachelor of Arts in Graphic Design program must also complete a portfolio. Bellevue University is accredited by the Higher Learning Commission (HLC). The School of Arts and Sciences at Midway University provides a variety of undergraduate, graduate, and professional programs in diverse fields represented in four departments, including the Department of Communication, Humanities, and Arts. The School of Arts and Sciences maintains the Christian mission of Midway University, incorporating Christian principles and values into its curricula to produce qualified, value-driven professionals. The Department of Communication, Humanities, and Arts offers an online Bachelor of Science in Marketing Communications degree program with a Graphic Design concentration. The program prepares students to pursue a variety of careers applying graphic design principles and techniques in business settings. The program blends coursework in advertising, marketing communications, and brand management with drawing, digital animation, and applied graphic design. Students prepare to pursue graphic design careers in a variety of professional settings, including public relations, brand management, advertising, creative design management, integrated marketing management, and corporate communication. Students in the online Bachelor of Science in Marketing Communications program must also complete a capstone project. Midway University is accredited by the Southern Association of Colleges and Schools Commission on Colleges (SACSCOC). See more of the Best Online Bachelor’s in Graphic Design Degree Programs. At the University of Maryland - University College, the average undergraduate is 30 years old, and the school specializes in providing flexible education opportunities for working professionals. An online bachelor of science in digital media and web technology prepares graduates to work in animation, multimedia, and electronic publishing. Regular input from alumni, design experts, and employers keeps the curriculum fresh. Courses are offered entirely online with some options for hybrid learning, which combines online coursework with traditional in-person instruction. Applicants must submit their high school transcript and their SAT or ACT scores. UMUC accepts up to 90 transfer credits from a variety of sources, including prior college learning, military experience, workplace training, and credit by exam. A student's residency status and financial need determine the price of tuition. All eligible students may apply for institutional scholarships. Since its establishment in 1878, Champlain College has championed accessible higher education. Today Champlain provides more than 50 fully online degree and certificate programs, including an online bachelor of science in web design and development. Fundamental visual design concepts, backend programming, and testing skills form the foundation of the degree. The program also helps students build strong business and communication skills. All courses are offered online, and students have access to instruction and assignments 24/7. The degree requires students to complete 120 credits, and allows them to transfer up to 90 previously earned credits. Major courses include web media, retail internet business, and usability in website and software design. The senior seminar project, or capstone, blends research and real-world application to address a contemporary computer information system industry challenge. Additionally, students pursue advanced coursework in either web design or web programming, and graduate with a professional certificate in whichever one they choose. As a private, nonprofit school, Champlain's tuition is the same for all online learners. Part-time students may pay per credit or per course. Full-time students (12+ credits per semester) must pay tuition per semester. Distance learners have access to an established support system, including an academic advisor, career advisor, professional development assistance through the Career Collaborative. Champlain College Online is regionally accredited by the New England Association of Schools and Colleges (NEASC). A leader in distance education, Franklin University's remote academic programs are designed by experts and taught by respected practitioners in their fields. Students can earn a bachelor of science in interactive media design completely online, gaining the skills necessary to pursue careers in website, gaming, and mobile app development. Franklin strives to provide students with a relevant, flexible curriculum. Instructors facilitate project-based learning, and students emerge from the program with a portfolio of professional work created for clients. The 120-credit program empowers students through a combination of visual design and web accessibility knowledge and technical programming skills. Students take required courses in topics like human computer interaction, team communication, and interactive media for advertising. Degree candidates must also complete a capstone experience, which includes a practicum where students take on leadership roles in their own projects and assemble a portfolio of their work. The curriculum also includes 24 elective hours, to be used towards advanced studies in the major or a minor such as web development or digital marketing. Students may transfer 24 credits of technical work, and up to 94 semester hours into Franklin. Those with fewer or no prior college credits apply as new students and must submit their high school transcript and SAT or ACT scores. Franklin provides distance learners with a variety of services, including one-on-one advising, online learning resources, and extensive professional development assistance. Franklin University is regionally accredited by the Higher Learning Commission (HLC). See more of the Best Online Bachelor’s in Web Design Programs. Students earning their bachelor’s degree in multimedia design work toward careers in creative industries like product design, media, technology, and marketing. Through coursework, students learn to solve design issues and define, discover, develop, and deliver interesting designs by using communication and information technology. Additionally, graduates improve their abilities to execute, create, and evaluate a variety of communication strategies. Multimedia design degree students can use their skills to develop a portfolio of their design work for future employment consideration. Many programs allow students to select a concentration within their degree. Learners can focus their education on a variety of topics, including web design and development, web game programming, graphics and multimedia management, and graphics and multimedia design. Each university offers its own unique multimedia design degree. Some programs require capstones, a thesis, or final projects. Be sure to consider whether your program requires on-campus immersions for online students or if coursework takes place entirely online. The bachelor’s degree in multimedia design coursework equips graduates with the skills and knowledge necessary to thrive in multimedia design. Students learn about production, digital design, and graphic applications. Courses differ with each institution, but students can expect similar core coursework from accredited programs. Introducing students to concepts, skills, principles, and language, the digital multimedia design foundations course gives students an overview of the tools they need to succeed in multimedia design. Teaching students to create animated works that communicate ideas, the animation fundamentals course explores the importance of animation to inspire critical reflection and enhance user interaction. In this course, students learn about the concepts, issues, and practice involved with contemporary design strategies for advertising, public relations, and print journalism. The design thinking and creativity course gives students an instruction and multidisciplinary exploration of the process, theory, methods, and artifacts of design through an examination of applications, examples, and ideas. The advanced multimedia production course allows students to work in multimedia production by using video editing, audio editing, animation software, web authoring, and image editing. Graduates of multimedia design programs can find employment in infographics, marketing, advertising, or web-based design, depending on the area of their expertise. Multimedia design careers require professionals to be creative in a way that appeals to different clients. Multimedia artists and animators create two- and three-dimensional models, visual effects, and animation for movies, television, video games, and other media. These professionals use various computer programs and illustrations as they create animations and graphics while working with a team of other artists and animators. Responsible for creating visual concepts, graphic designers communicate ideas that inform, inspire, and captivate consumers. They develop layouts and production designs for a variety of applications, including brochures, magazines, corporate reports, and advertisements. Web developers design and maintain websites. These professionals use the site’s technical aspects, such as performance and capacity, to measure the website’s speed and how much traffic the site can handle. Web developers often create site content.